A goalkeeper of spectacular ability, Ian made an enormous impact on the club during his four seasons, before leaving with everyone’s best wishes to join TEK United, where he has continued to excel at intermediate level. Joining 2011, he found himself battling with Mike Frawley for the first team number 1 jersey, and surely there wasn’t another junior club in the country with not one but two goalkeepers of such elevated standard. 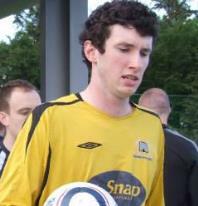 Memorably, during his debut season he was once brought off the first team bench by Ronnie McLoughlin as a centre forward, to kill the final few minutes of a cup tie, only for ten-man Booth Road Celtic to grab a stoppage time equaliser, such that Ian played the entirety of extra time as a lone striker, before lashing home a penalty as Seaford won the shoot-out. Having established himself as first team keeper, Ian came into his own, showcasing his astonishing reflexes, impeccable handling and impressive distribution. Perhaps his finest performance was in a home match against Portlaoise AFC in 2014, when he single-handedly kept the visitors at bay with a string of astonishing blocks, before Steve Hyland grabbed the winning goal at the other end with the last kick of the game. Fittingly, Ian’s final match with the club was the 2014 Arthur Lynch Cup Final, delivering a typically composed display to help the club to its first trophy.